In an ongoing article about crossing the Equatorial Countercurrent (to be posted shortly) we confront a classic navigation exercise in optimal routing through and across currents. More often than not, there are external factors that dominate how we choose to cross a current, but it is valuable to have in mind the fundamental results for comparison. The problem is illustrated below. The situation looks idealized, but as it turns out, the values are fairly realistic—we are for now disregarding the performance of the vessel (assuming a constant speed on any heading) and also ignoring the constant equatorial currents of 1.0 kts flowing the other direction on each side of the countercurrent. We will come back to that reality, but as first guess we assume that does not affect our solution to this problem. The vessel in this case is a custom single-handed rowboat, on its way to Cairns, AU, after departing from Neah Bay, WA about 5 months earlier. Figure 1. Pacific Equatorial Countercurrent of 1.0 kts spreads over a band about 200 nmi wide. In some parts of the ocean in some seasons it could be twice this wide. Sometimes it does not exist. We start the computation from a position along the rhumb line route that is 300 mi off the top edge of the current band, and ask for the fastest time to get to the finish line, which is defined here as any point on the line shown that is equidistant from Cairns, or more generically, on the line perpendicular to the course line, since Cairns is indeed more than 4,000 miles away from this point! Assume the vessel can take any route, but maximum speed is 2.0 kts. We are looking for an answer that is a number of days, hours, and minutes, plus the actual route proposed. It will take some review of current sailings, but that is by no means a hint. Standing by for answers by comment or email to helpdesk@starpath.com. Here are a couple starting points. 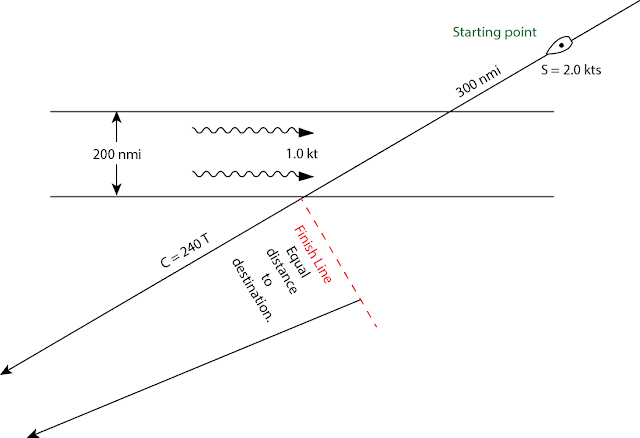 If there were no countercurrent at all, the trip would be 300 mi to the current edge, then staying on the rhumb line (RL) course at 240T, means we are on a 30º right triangle with the sides of the current so there are various ways to compute the distance across, but there is no point in doing that. We can layout this route and current band in a nav program such as OpenCPN and just read off these values. Or plot it on a piece of paper at some random scale and measure it that way. How we come up with the distances does not matter. In this case the RL distance across the current is 400 nmi for a total distance of 700. At 2 kts, this takes 350 hr = 14 days 14 hr. The time to get across the current is going to be longer, so the question is how much longer and how does this depend on our heading while crossing. There are several choices. (1) You can drive up to the current following the RL (300 nmi) then crab acoss the current heading into the current the right amount to make good the RL course. This means we will be still be going 1.5 kts through the water, but at some up current heading that lets us make good some slower speed but keeps us tracking along the RL. This is a standard vector problem in navigation. Find heading and resulting SMG that yields a CMG = RL course. There are analytical as well as graphic solutions. (2) Another choice would be to just enter the current when we hit it without changing course. We will then get set down stream by some amount and after we emerge from the current we have to make it back to the finish line. This is also a standard problem: how much do I get set in a know current; that is, given speed and heading as well as current set and drift, find SMG and CMG. Then DR back to the finish line. (3) A kayaker might first think of computing the total set during a straight-across paddle, then head for a point that far up stream from where the RL enters the stream and the paddle straight across. You will then get set right down to your RL track when you exist the current. (4) And there could be other solutions... maybe some combination of these pure solutions. The reader's goal now is to choose a method and solve for the total time, and see what you come up with for the shortest time? Give your time precise to the minute as we will likely get more than one right answer, and it might come down to precision of computation. The winner will receive a signed copy of Emergency Navigation. We will wait until Feb 1 to see what answers we get, then post our solutions. Note that even if you are wrong, if you are the only submitted answer you win! Later we can also think on whether our answer depends on the speed of the boat or the speed of the current, or the ratio of the two, or is the fastest approach true for any circumstance? Observation: there is at least one national sailing organization certification exam that believes there is only one answer! Another part of this query, since we already know of at least three different approaches, is to ask if there is some general principle that directs us to the right solution, which would then save us testing the numerical values of the other solutions? This would presumably be some argument from math or physics. The solutions are online in another article.